View our complete selection of Marmot Sleeping Bags & Pads. We offer Marmot Sleeping Bag product videos, consumer reviews, and price alerts. Marmot Sawtooth Long - The Marmot Sawtooth MemBrain Sleeping Bag is one of the most versatile down bags on the market. The versatility stems from its waterproof/breathable two-layer MemBrain® fabric which protects the 600+ fill goose down from moisture. Tested to 15F degrees, this is a great bag for alpine excursions where you're hiking through snow and are often battling wetness and condensation. The down insulation makes it lightweight and packable so it effortlessly assimilates itself into your pack. Marmot Trestles 0 Long Sleeping Bag - Marmot Trestles 0 Long. The full-featured Trestles 0 is a reliable, all-purpose synthetic bag that insulates even in sustained cold and damp conditions. Updated style lines and fabric liner keep you comfortable on backpacking, trekking and mountaineering trips. Insulated Collar with Easy Access Cord - Engineered to Close Without Velcro, Keeps Warm Air Trapped in Your BagLofty SpiraFil insulation combines hollow fibers and denser, solid synthetic fibers in order to offer a balance of warmth, softness, and compressibilitySpiraFil 120 high loft insulation, EN tested. Marmot Plasma 30 Long Sleeping Bag - The Marmot Plasma 30 Sleeping Bag has all the bells and whistles you’d expect of a high performance down sleeping bag. The insulated collar has an easy access cord to keep warm air trapped in your bag, the insulated draft tube helps keep cold air on the outside and the full-length zipper makes it supes easy to get in and out. They even thought to make a Velcro-free face muff so you don’t get scratched by the zipper or drawcord. Marmot Plasma +15F Sleeping Bag - There are plenty of reasons as to why the Marmot Plasma 15 Degree won Backpacker Magazine's Editor's Choice Award, not the least of which is its impressive warmth-to-weight ratio. At under 2lb, it is the new gold standard for 15 degree bags. Utilizing 900+ fill down, it traps all your warm air near your body and can compress down to almost nothing. The vertical baffle system (aka, Insotect Flow™) reduces weight and allows your body heat to easily/efficiently transfer to your extremities, with an insulated draft tube which prevents cold from leaking through the full-length zipper. Marmot NanoWave 55 - Marmot Nanowave 55F Synthetic Sleeping Bag - Regular Size Features. Marmot Nanowave 55F Synthetic Sleeping Bag. 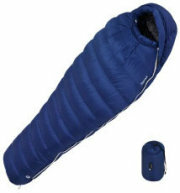 The Marmot Nanowave 55F Synthetic Sleeping Bag is ideal for those cold nights spent outside with nature. The two-way zipper sliders are great for venting and joining the bags together. With the bag's drawcords you will no longer have to fumble in the dark to find them, as they can be easily felt out when needed. Marmot Helium 15 Degree Down Sleeping Bag Regular - Remarkably light and compact, the Marmot Helium fifteen degree down sleeping bag delivers impressive insulation. Use it as a three-plus season bag to substantially reduce your load while backpacking and mountaineering. Zipper guard keeps the fabric from getting caught in the zipper. Passive collar helps prevent heat loss around the neck and head.850+ Fill goose down. Down filled draft tube. Nautilus hood. Hood draw cord. Full length zipper for easy in/out. Marmot Cloudbreak 30 Long - The Marmot Cloudbreak 30 is a super cozy synthetic sleeping bag that is versatile enough to handle your outdoor sleeping needs for most of the year. Synthetic insulation (mapped heavier around core and feet) can handle wet conditions and constant compression without losing any heat. This makes it an excellent option for cowboy camping (sleeping out under the stars), or for bivy camping when condensation might otherwise be an issue. Marmot Col MemBrain Sleeping Bag - When you're up over 14k feet or exploring the deep recesses of the alpine backcountry, you need a serious sleep system to get you through your inactive times. Enter the Marmot Col MemBrain -20F Sleeping Bag. Baffled with 800+ fill down insulation, it will trap warm air near your body for unmatched warmth. It is light and compressible so it won't take up much pack space. On trips where you need a -20 bag, I'm guessing pack space is at a premium. Marmot Helium Regular - The Marmot Helium packs smaller than a loaf of bread, weighs less than two pounds and keeps you warm down to 15°, making it the lightest, most versatile bag on the market. Velcro®-free face muff; Hood draw cordZipper guards; Down-filled draft tubeCertified 850+ Fill Goose DownSmaller and shorter zipperSide blocked below end of zipperStretch tricot bafflesStuff sack and storage sack includedClassic trapezoidal foot box. Marmot Trestles 30 - Marmot Women's Trestles 30 Long. With a women-specific design and synthetic insulation the full-featured Women's Trestles 30 is designed for sustained cool, wet weather while backpacking, mountaineering and river rafting. This season, we’ve improved the liner fabric and style lines for added comfort. EN Tested. SpiraFil High Loft Insulation. Dual Zippers. Women's Specific Fit - More Insulation in Key Areas.. Wave Construction. Classic Trapezoidal Foot Box. Compression Stuff Sack. "Feely" Draw Cords. Marmot Never Summer MemBrain Sleeping Bag - FEATURES of the Marmot Never Summer MemBrain Sleeping Bag. SPECIFICATIONS of the Marmot Never Summer MemBrain Sleeping Bag.100% Nylon Plain Weave WR liningMemBrain®2L 100% Nylon Ripstop shellNautilus 5-Baffle Hood - 5 Chambers of Down Around Head for Better Down Control and Fit, Hood Cord is Positioned for Easy AccessCertified 600+ Fill Power Goose DownDown-filled Collar with Easy Access Draw CordPertex© Shield® Waterproof/ Breathable ShellTwo Way Zipper Sliders - For Venting and Mating of Bags. Marmot Never Winter Sleeping Bag - You'll sleep so soundly in the Marmot Never Winter Sleeping Bag that it'll feel like a time machine that leaps forward 8 solid, restful hours at a time. Perfect for summertime trips out to the lake (everybody has a "the lake" they like to go to, right?) and sleeping out under the stars. This 30F degree bag is stuffed with 650-fill down which will trap your body heat for sustained warmth. Marmot Cloudbreak 20 Degree Sleeping Bag - Laugh in the face of long miles and cold, wet nights when you're carrying the Marmot Cloudbreak 20 Sleeping Bag in your backpack. 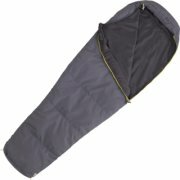 Two types of ultralight synthetic insulation give this sleeping bag a 20-degree temperature rating, a weight of just under three pounds, and the unique ability to retain warmth even when wet. Marmot's engineers used 'anchors' of Thermal R Micro to add insulation at your feet and core, while the basic Thermal R insulation takes care of everything else from your ankles to waist and from your shoulders to head. Marmot Always Summer Sleeping Bag - Always great to have on hand in the summertime months for impromptu jaunts into the backcountry, the Marmot Always Summer Sleeping Bag is ready to join you on your warmer weather camping trips. It is rated to 40-45 degrees and great for taking the chill out of those summer nights where the temperature dips. The 650-fill down offers an impressive warmth-to-weight ratio, weighs just over 2lb and is super compressible. Marmot Sawtooth +15F Sleeping Bag - The Marmot Sawtooth 15 Degree Down Sleeping Bag weighs just three pounds—that's a mere pound for each of the three seasons you'll be camping in. Compact, lightweight, and insulated by lofty 650-fill down insulation, the Sawtooth helps you slumber soundly spring through fall. A host of features like a down-filled collar, five-baffle hood, roomy, trapezoidal footbox, and draft-stopping zipper tube add further to the overall comfort during the more mild months. Marmot 5 F Snowcrest Sleeping Bag - 600 Fill Power Down Mummy Long - When temperatures plunge as night decends in the backcountry, Marmot's Snowcrest 5° sleeping bag wraps you in the lightweight, lofty warmth of 600 fill power goose down. Includes nylon stuff sack and cotton storage bagInsulated draft tube600 fill power goose down insulation is Marmot comfort-rated to 5°FDown-insulated collar with drawcordAnatomical hood with head gasketGround level side seamsMade in ChinaClassic trapezoidal footboxCannot ship to AustraliaStretch tricot bafflesMummy bag. Marmot Atom 40F Sleeping Bag - The Marmot Atom 40 Sleeping Bag is the “it” bag for alpinists and spur-of-the-moment road travelers. Hunter S. Thompson totally would have had this bad boy in his trunk. This 850+ fill goose down Marmot sleeping bag has 8 ounces of high quality down hand stuffed into sewn-threw baffles, which helps keep the weight down to 1 pound 5.52 ounces. 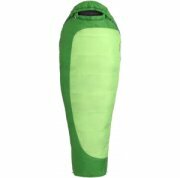 This warm weather sleeping bag has six baffles around the head for optimal down control and a close fit, along with a conveniently positioned hood cord for easy access. Marmot Cwm Membrain Sleeping Bag - Adventurers who brave the most inhospitable places on earth trust their cold-weather survival to Marmot’s warmest sleeping bag. The 800+ fill-power goose down is independently tested and certified by a lab, and retested before construction to ensure the goose down meets the highest standards for warmth and overall performance. The durability and waterproof, breathable properties of the MemBrain® fabric protects the insulation from harsh weather conditions and reduces the buildup of internal condensation to increase comfort.